London's Novello Theatre has been transformed into a Greek island paradise to host the musical that has seen over 60 million people all around the world fall in love with it's feel-good atmosphere. Mamma Mia is the musical that has characters, the story and the timeless music of ABBA's well intertwined into the structure that gives their audiences an night they'll remember. The story combines love, laughter and friendship in a 2 hr 15 minute performance that demonstrates why it's become a much loved musical for 18 years. Mamma Mia captures the story of a young woman, Sophie (Georgina Castle) determined to discover the identity of her father that has been swept under the carpet for so many years by her mother, Donna Sheridan (Caroline Deverill) and she only knows about her potential fathers through Donna's diary that Sophie reads. Three men are invited back to the island where they met and fell in love with Donna 20 years ago, bringing with them the good and bad times. The question on everyone's mind is which one is the biological father? Donna is going to need a lot of courage and persuasion from her friends Rosie (Jacqueline Braun) and Tanya (Kate Graham) to finally face the past that she fought to keep away. 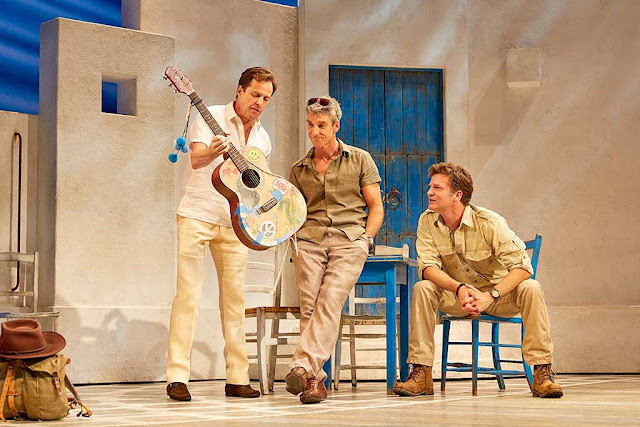 The stage is transformed into a Greek island with simplicity of a traditional white Greek buildings turning set and a backdrop of sea blue. This simplistic set that transforms between the preparations of a wedding as well as the main thread of discovering the identity of Sophie's dad. The simplicity leaves an ethos towards the story itself and the iconic musical score. The 2017-18 cast feel very fresh and full of punch from the get go, with Anthony Van Laast's technical choreography giving bounds of endless energy and enthusiasm. 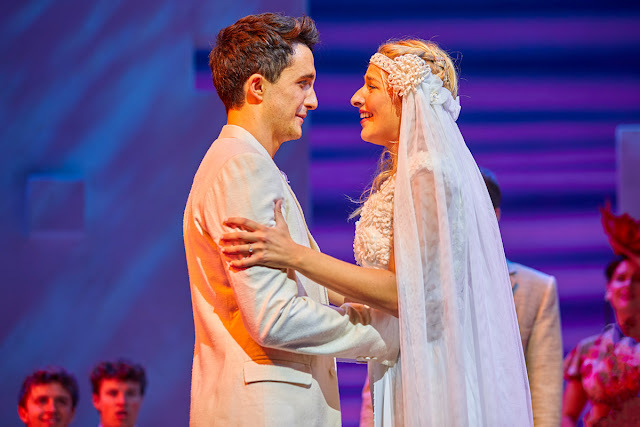 The mixture of the ABBA songs, camp dance routines, platform boots and Lycra costumes surround a soppy romance comedy script that works so well and is no surprise that Mamma Mia's success isn't just in the UK but in other countries too! Georgina Castle's portrayal as Sophie and playing a curious, loved up young woman really captivates your interest from the beginning. I loved her fresh take on an iconic role and particularly in a musical that's been so popular for 18 years. She definitely brings something different to the role and shows genuine connections with the other characters, especially her husband to be, Sky (Christopher Jordan-Marshall). It was hard not to love the performances from Donna's friends Rosie (Jacqueline Braun) and Tanya (Kate Graham) who were the real spirit of the show, with their feisty and fun characteristics, having the audience in stitches with their natural flare for the comedic elements of the musical. Their relationship with Donna (Caroline Deverill) is heart warming and exactly the support network and tribe every woman needs. Their rendition of 'Chiquitita' was a real acknowledgement of their friendship that I absolutely loved watching. Caroline's heartwarming mother instincts are distinctive throughout the musical and grasp hold of your attention, her vocals were pretty damn gorgeous too! 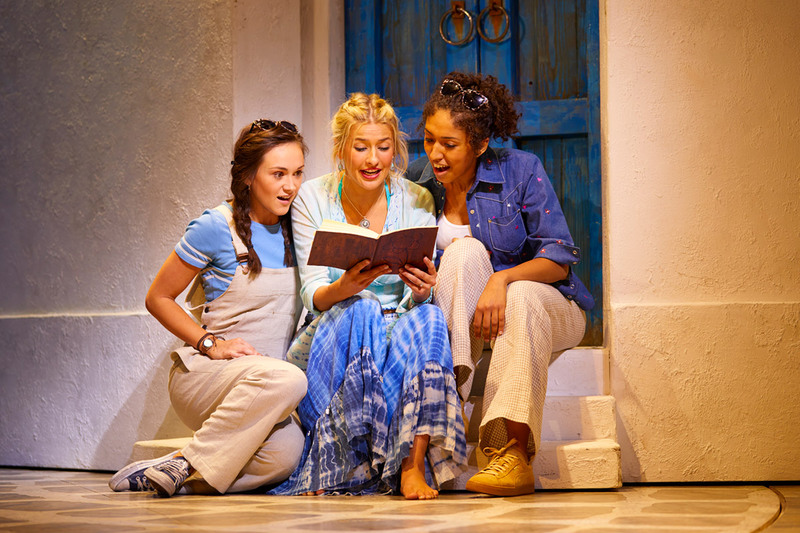 Mamma Mia is a real fun musical that is suitable for all ages. There's something in it for everyone, weather that is the musical score, the storyline or the amazing costumes that we see. The cast were incredible I loved the finale that really allowed the audience to get on their feet and sing along with the ABBA timeless hits, which for me was the moment I had been waiting for the entire evening. Definitely book a visit to see the iconic smash hit musical at Novello Theatre. Make sure you don't forget your dancing shoes too! This musical is definitely worth watching over and over again. I WAS IN london couple of months ago, wish the show was playing back then..
Would have really loved to watch it. I have seen this movie and play promoted on so many outlets, yet I still have not seen it lol. It is definitely on my must watch list especially the play! Thank you for sharing! This is the perfect movie for a musical. I think I would absolutely enjoy this performance. Thank you so much for sharing and all of the details. oh, how fun! My oldest and I loved the movie and I think this performance would be fun to watch. The sing-a-long at the end would be no doubt be the highlight of the evening! This is timely as we are seeing Abba in concert tonight. My husband saw Mama Mia in London several years ago and who knew he would be such a fan? Oh, I love Mama Mia! Unfortunately, I've never had the privilege to see a live musical of it though. Meryl Streep's version will suffice for now. Heck, it even made me become an ABBA fan! LOL! But one day.... the live version will happen for me. Oh you must see a live musical of it, it has to happen it's so good! Mamma Mia is such a classic! I've only seen the movie version, but would love to see it on stage. The music can't be beat! I saw this on Broadway and had a wonderful time. It was one of the best shows I have seen. I would recommend it to everyone. Awesome review of Mamma Mia! I've never seen it, so it was great to read about it. Also,your pictures were awesome! I love going to the theatre! Especially to interactive shows like this, which allows the audience to sing (and sometimes dance) along with the cast. I've never been to a musical, but this sounds like a fun one! I wanted to catch the phantom of the opera when we were in Vegas one here but they had stopped doing it that year, ugh! I love Mamma Mia! Such a great show live, and a great classic! This is a classic! Will love to catch this at least once, in Singapore or London, hopefully!